UW and Michigan back out for the third period. Should be a good final frame! Referees having a meeting with the captains before the third period starts. 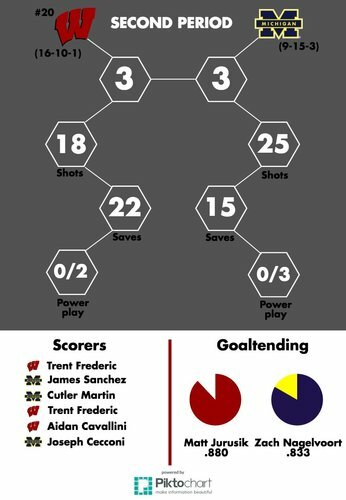 UW and Michigan 3-3 with 20 minutes left. We'll head into the final period all tied at three. Boka and Greenway got 10-minute misconducts at the end of the second, so both teams will be down a defenseman for half of the third. And yes, both Boka and Greenway got penalties while already serving penalties. Impressive. Badgers going right on the power play as the Wolverines are given a hooking penalty. 1:23 into the third. Dancs gets called for hooking 1:23 into the third. UW on the power play. 18:36 3rd | U-M's PK goes back to work as Dancs is called for hooking. UW comes up empty on the man advantage and we are back to 5-on-5 hockey. BADGERS GOAL: Jake Linhart deflects in a rebound with his skates for a 4-3 Badgers lead with 12:24 left. Going to replay. It's a good goal. 4-3 UW with 12:24 to go in the game. 12:24 3rd | After further review from the officials, Wisconsin's goal stands and they regain lead at 4-3. Michigan ties the game again at 4-4 with 11:33 to go. 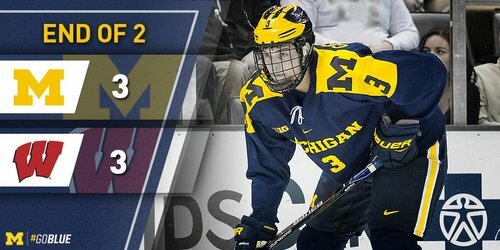 WOLVERINES GOAL: For the second time, Michigan answers within a minute. Adam Winborg appears to get this one on a bounce off a stick. 4-4. @AdamWinborg ties it back up at 4-4 with his sixth of the year! BADGERS GOAL: Peter Tischke redirects a shot between Nagelvoort's pads for a 5-4 UW lead with 8:57 left. Jurusik is struggling to catch pucks right now. He is putting out rebounds on almost every Michigan shot. Eight minutes to go in regulation and the Badgers lead 5-4. Michigan leads SOG 34-26. 8:00 left in the third, UW leads Michigan 5-4. Wagner redirected a Malone shot off the post. Less than 5 minutes left, UW leads Michigan 5-4.